Brazilian Government has given approval for the sale of three Super Tucano A-29 attack aircraft to Nigeria. 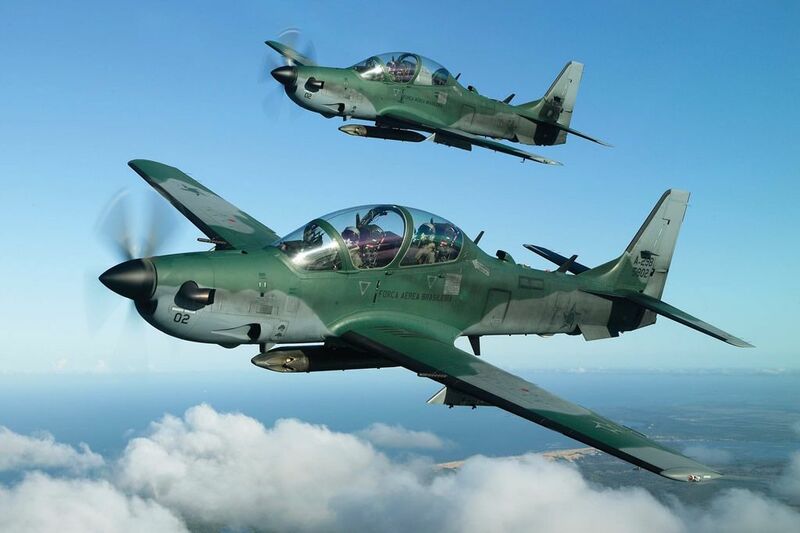 The Brazil Embraer Defence and Security Limited thuesday disclosed that the Brazilian Government has given approval for the sale of its three serviceable pre-owned Super Tucano A-29 attack aircraft to Nigeria. The acquisition of this aircraft by the Nigerian Air Force (NAF) is expected to boost its operational capabilities in tackling insurgence and militancy in the country. Aside its deployment for Surveillance, Reconnaissance and counter-insurgency missions, the aircraft could also carry a wide array of armaments, including precision guided monitors, advance avionic, communications and sensors. Additionally, the aircraft can also operate in remote and un-paved airfield while the maximum speed of the aircraft is approximately 590 kilometres per hour. Conveying the approval to the Chief of Air Staff (CAS) Air Mshl Sadique Abubakar at the NAF Headquarters Abuja, the Embraer Contract Negotiator, Mr Eneias de Souza Freitas said, “the Brazilian Ministry of Defence has informed them that approval for the sell of 3 Super Tucano A-29 aircraft to Nigeria has been given,” adding that Brazilian government has authorized its Air Force to transfer the aircraft to Embraer Defence and Security, for onward delivering to the NAF. Mr Freitas further said that the legal requirement and procedures were being finalized by the Brazilian Air Force while promising to facilitate the legal process “this is of concerned to us, we will for sure take your message back to the people with the legal procedures to quicken the process.” Mr Freitas said. Meanwhile, the CAS disclosed that the idea by the NAF to acquire Super Tucano A-29 aircraft was mooted in 2015 and appropriated in the 2016 Budget. He urged the company to facilitate the procurement process to enable the NAF take delivering of the aircraft within reasonable time. The CAS added that a team of NAF officers would visit Brazil to further inspect the aircraft. Nigeria also intends to purchase new Super Tucano A-29 aircraft from the United State. Mr Freitas was accompanied by the Embraer Director of Business Development, Europe and Africa, Mr Jose Gustavo.